Every day, designers create the world around us: every website you’ve visited, book or magazine you’ve read, every app you’ve used on your phone, every chair you’ve sat on, almost everything around you has been consciously designed by someone. Since this activity is so important, an area of academia known as design research is concerned with studying how design works, and how to do it better. The ultimate aim for design research is to create a theory for designing a particular thing (such as websites, or books, or apps, or chairs) that teaches us how to design that thing well. One way to try and produce these theories is to actually design a bunch of things (websites or books or apps or chairs), and then document what worked and what didn’t. This is the basic idea behind research through design. In the rest of this post, I’ll explain a bit more about research through design, as well as what we can realistically expect from the theories we produce using this process. Design shifts the world from its current state into a “preferred” state through the production of a designed artefact. My PhD dissertation described the design of two visual analytics tools I developed, with a focus on documenting and theorising those aspects of the design that (a) facilitate the specific user tasks I identified as being important and (b) reduced expertise requirements for users. Thus, the approach to knowledge production was research through design (Frayling, 1993). The distinction between research through design, and merely design, is one of intent. In the former, design is practiced with the primary intent of producing knowledge for the community of academics and practitioners. Consequently, the design artefact cannot stand in isolation – it must be accompanied by some form of discourse intended to communicate the embodied knowledge result to the community. Moreover, this discourse must make explicit how the artefact is sufficiently novel to contribute to knowledge. In a non-research design activity, neither annotative discourse nor novelty is necessary for success. Zimmerman et al. (2007) propose four general criteria for evaluating research through design contributions: process, invention, relevance, and extensibility. Process refers to the rigour and rationale of the methods applied to produce the design artefact, and Invention refers to the degree of academic novelty. Relevance refers to the ability of the contribution to have a wider impact. Extensibility is the ability of the knowledge as documented to be built upon by future research. Why is there no such thing as a complete theory of design? When designing systems in some domain, it may seem an attractive proposition is to seek a theory of design that not only characterises specifically the nature of these systems and how their important properties may be measured, but also prescribes a straightforward, deterministic strategy for the design of such systems. When I started out in my research, I wanted to produce a theory for how to design systems that would let non-experts use visual tools to perform statistics and machine learning. I initially anticipated that such a prescriptive theory would be elusive for multiple reasons, including the nascency of interactive machine learning, the incomplete characterisation of potential applications, and a wariness of the challenges surrounding “implications for design” (Stolterman, 2008). Towards the end of my PhD, I came to the position (and I still hold it) that a complete design theory is not only elusive, but impossible – not just for visual analytics tools, but any design domain. This is because theory underspecifies design, and design underspecifies theory (Gaver, 2012). Theory underspecifies design because a successful design activity must culminate as an ultimate particular (Stolterman, 2008): an instantiated, designed artefact, subject to innumerable decisions, situated in a particular context, and limited by time and resource constraints. Design problems are inherently wicked problems (Buchanan, 1992); they can never be formulated to a level of precision which affords ‘solving’ through formal methods, and no theory for design can profess to provide a recommendation for every design decision. Conversely, design underspecifies theory, in the sense that an ultimate particular will fail to exemplify some, or even many, of the nuances captured in an articulated theory. This is not to say that we should do away with theory altogether and focus solely on artefacts themselves. Gaver’s view, to which I am sympathetic, is that design theory is “provisional, contingent, and aspirational”. The aim of design theory is to capture and communicate knowledge generated during the design process, in the belief that it may sometimes, but not always, lead to successful designs in the future. Frayling, Christopher. Research in art and design. Royal College of Art, London, 1993. Zimmerman, John; Forlizzi, Jodi, and Evenson, Shelley. Research through design as a method for interaction design research in HCI. In Proceedings of the SIGCHI conference on Human factors in computing systems, pages 493–502. ACM, 2007. Stolterman, Erik. The nature of design practice and implications for interaction design research. International Journal of Design, 2(1), 2008. Gaver, William. What should we expect from research through design? In Proceedings of the SIGCHI conference on human factors in computing systems, pages 937–946. ACM, 2012. Buchanan, Richard. Wicked problems in design thinking. Design issues, 8(2):5–21, 1992. I originally wrote this post in 2016 for the Sparrho blog. Have you ever wondered whether doctors are consistent in their judgements? In some cases, they really aren’t. When asked to rate videos of patients with multiple sclerosis (a disease that causes impaired movement) on a numeric scale from 0 being completely healthy to 4 being severely impaired, clinicians struggled to be consistent, often giving the same patient different scores at different times, and disagreeing amongst themselves. This difficulty is quite common, and not unique to doctors — people often have to assign scores to difficult, abstract concepts, such as “How good was a musical performance?” or “How much do you agree or disagree with this statement?” Time and time again, it has been shown through research that people are fundamentally inconsistent at this type of activity, no matter the setting or level of expertise. The field of ‘machine learning’, which can help to automate such scoring (e.g. automatically rating patients according to their disability), is based on the method that we can give the computer a set of examples for which the score is known, in the hope that the computer can use these to ‘learn’ how to assign scores to new, unseen examples. But if the computer is taught from examples where the score is inconsistently assigned, the result is that the computer learns to assign inconsistent, unusable scores to new, unseen examples. To solve this problem, we brought together an understanding of how humans work with some mathematical tricks. The fundamental insight is that it is easier and more consistent for humans to provide preference judgements (e.g. “is this higher/lower/equal to that?”) as opposed to absolute value judgements (e.g. “is this a 4 or a 5?”). The problem is, even if you have as few as 50 items to assign scores, you already have 50 x 49 = 2450 ways of pairing them together. This balloons to nearly 10,000 comparisons when you have 100 items. Clearly, this doesn’t scale. So we scale this using a mathematical insight: namely, that if you’ve compared A to B, and B to C, you can guess with reasonably high accuracy what the relationship is between A and C. This ‘guessing’ is done with a computer algorithm called TrueSkill, which was originally invented to help rank people playing multiplayer games by their skill, so that they could be better matched to online opponents. Using TrueSkill, we can reduce the number of comparisons required by a significant amount, so that increasing the number of items no longer results in a huge increase in comparisons. This study has advanced our understanding of how people quantify difficult concepts, and has presented a new method which balances the strengths of people and computers to help people efficiently and consistently provide scores to many items. Why is this important for researchers in fields other than computer vision? This study shows a new way to quickly and consistently have humans rate items on a continuous scale (e.g. “rate the happiness of the individual in this picture on a scale of 1 to 5”). It works through the use of preference judgements (e.g. “is this higher/lower/equal to that?”) as opposed to absolute value judgements (e.g. “is this a 4 or a 5?”), combined with an algorithmic ranking system which can reduce the need to compare every item with every other item. This was initially motivated by the need to have higher-quality labels for machine learning systems, but can be applied in any domain where humans have difficulty placing items along a scale. In our study we showed that clinicians can use our method to achieve far higher consistency than was previously thought possible in their assessment of motor illness. Why is this important for researchers in the same field? This study describes a novel method for efficiently eliciting high-consistency continuous labels, which can be used as training data for machine learning systems, when the concept being labelled has unclear boundaries — a common scenario in several machine learning domains, such as affect recognition, automated sports coaching, and automated disease assessment. Label consistency is improved through the use of preference judgements, that is, labellers sort training data on a continuum, rather than providing absolute value judgements. Efficiency is improved through the use of comparison in sets (as opposed to pairwise comparison), and leveraging probabilistic inference through the TrueSkill algorithm to infer the relationship between data which have not explicitly been compared. The system was evaluated on the real-world case study of clinicians assessing motor degeneration in multiple sclerosis (MS) patients, and was shown to have an unprecedented level of consistency, exceeding widely-accepted clinical ‘gold standards’. In this post I describe a minimal, yet comprehensive personal backup solution. It is relatively easy to implement, using only the built-in features of your operating system, and is quite cheap as it requires only 4 hard drives (and can be accomplished with even fewer). Despite being extremely simple, it has the characteristics of a complete backup system and protects against several causes of data loss. It is a sensible backup strategy as of June 2014. This post is aimed towards the technologically-inclined reader. Preparation: Acquire 4 external hard drives, each as large as you wish, all of roughly the same capacity. I will refer to them as A1, A2, I1 and I2. Archival drives: Drives A1 and A2 are archival drives. They contain data that you no longer keep on your primary computer, and data that you no longer expect to change. This might include photos, music, and old work. You must ensure that A1 and A2 always have the same content as each other. Incremental backup drives: Drives I1 and I2 are incremental backup drives. They will contain a versioned history of all the files on your primary computer. For instance, you can set them both to be Time Machine drives. Time Machine is the incremental/differential backup software that comes standard with Mac OS X (alternative solutions are available for other operating systems). Location: Drives A1 and I1 are stored at the same primary location, such as your home. Drives A2 and I2 are stored a different, secondary location, such as your workplace. What you need to do: Update the content on A1 and A2 at your convenience, making sure they are always in sync. Make incremental backups with I1 and I2 as frequently as possible (at least once daily). With Time Machine this amounts to merely plugging in the drive (or connecting to the same network as the drive, if you use Time Capsule, or you can use something like a Transporter). Under the event of data loss due to a hardware or software failure, that is, if one of the drives fails or the data on one of the drives gets corrupted, there is always another drive with a copy of the same data. This drive may be used until the failed/corrupt drive is replaced. Under the event of data loss due to human error, such as accidentally deleting or overwriting a file, there are two incremental backups from which any historic version of the file can be restored. Under the event of data loss due to natural disasters (such as a fire, power surge, or flood) or theft, which causes the drives in one location to be destroyed or stolen, there is always a duplicate of the drives in another location which may be used until the destroyed/stolen drives are replaced. This is what is known as an offsite backup. Both archival drives or both incremental backup drives failing simultaneously: this is extremely unlikely, but if you’re worried about it you can add a third drive of each type. Failure to make incremental/archival backups often enough: this is your problem, not a problem with the scheme. You use Windows/Linux: I believe Windows has an equivalent to Time Machine called “Windows Backup“. Linux users can probably fend for themselves and find something that works for them. You primarily use multiple computers: You will need an additional pair of incremental backup drives for each additional computer you use. You need to be able to immediately continue from where you left off in case your computer stops working: You will need to start creating bootable clones, which can be achieved using software such as Disk Utility (comes standard with Mac OS X), SuperDuper or Carbon Copy Cloner. For Windows users, Windows Backup can also create bootable clones. These can be stored on additional drives or on your archival drives. You don’t mind third party or cloud services: I recommend looking into a solution such as Crashplan or BackBlaze. You can use these services to augment the 4 drive solution or to replace it entirely, depending on your level of trust and the quality of your Internet connection. You are extremely price conscious: It is possible to implement this scheme with only two drives. In this scenario you will have to create two partitions on each drive, one for archival and the other for the incremental backup. The drives must of course still be stored at separate locations. I personally prefer the 4 drive version because (1) hard drives are not yet capacious enough that cheap commodity drives can be partitioned into useful sizes for those with lots of data, (2) partitioning necessitates erasing the drive, (3) I am leery of increased opportunities for filesystem corruption with multiple partitions, and (4) it is much less effort to replace drives if they only serve a single purpose. Since you will be acquiring multiple drives, you have the opportunity to spread your risk even further. By buying drives from different brands, you reduce your vulnerability if any single manufacturer or hard drive model has a faulty run. It is also good to have a mix of hard drive ages, since very young as well as very old drives appear to have a higher failure rate than those between the ages of 1 and 3 years. I hope this is of some use. I was tired of thinking about backups and tired of researching third party backup solutions, so I settled on this compact, no-frills setup that can cope with all major threats to your data. If you have a suggestion or notice a deficiency, please leave a comment! In this post I’d like to describe an issue that is almost never addressed in statistics courses, but should be, because it causes a lot of mistaken inferences. It is an issue so pervasive that I routinely see papers published in refereed journals that make this mistake. So if you can’t bother to read through the rest of this post, there are three things you must take away. A non-significant result does not allow you to “accept” the null hypothesis. A high statistical power does not allow you to “accept” the null hypothesis. If you find yourself wanting to “prove” the null hypothesis when you are testing whether one variable affects another in a meaningful way, the proper way to do it is through equivalence testing. Important thing #1. A non-significant result does not allow you to accept the null hypothesis. This is a ridiculously common mistake. Suppose you’re comparing the heights of a group of men against the heights of a group of women using a t-test. The t-test spits out a p-value of 0.3, which is higher than your chosen significance level 0.05. Surely this means that the null hypothesis, which is that the group means are equal, is true, right? Okay, what if the t-test spits out a p-value of 0.99, this means that there is a 99% chance that the group means are equal right? If your p-value is greater than your significance level, you cannot conclude that the group means are equal. You can only conclude that your data does not refute the hypothesis that your group means are equal. The p-value is probability of the t-test statistic being at least as extreme as the one you observe, assuming the group means are equal. This logic is sound because if N were true, D would be false. D is true, therefore N must not be true. Do you see why this is wrong? There might be many other reasons that the car will not start, for example, the ignition may be broken, the wheels may be missing, or the car may have hit a wall. However, it is perfectly sound to say that if the car moves (D), then we reject the null hypothesis that the petrol tank is empty (∴¬N). Bottom line: a non-significant p-value is not evidence of the null. Important thing #2. A high statistical power does not allow you to “accept” the null hypothesis. Let us look a little more carefully at the actual definition of the power of a statistical test, and what it is useful for. The power of a statistical test is defined as the probability of rejecting the null hypothesis, given that the null hypothesis is indeed false. Power nearly always depends on (a) the level of statistical significance α at which you wish to reject the null hypothesis, (b) the magnitude M of the effect size of interest, and (c) the size S of the sample. So the power of a t-test is the probability that you observe a difference large enough in your sample S to be significant at the level α, given that there exists a true difference M. This is useful if you want to calculate how large your sample should be to be reasonably confident of detecting a true difference of a certain magnitude (or alternatively, what magnitude of difference you will be reasonably confident of detecting for a certain sample size). A high statistical power is just as useless in conclusively telling you anything about whether the null hypothesis is true. Concretely, in the case of a t-test, a high statistical power combined with a non-significant p-value does not allow you to claim that the null hypothesis is true. This is actually logically sound, and is exactly the same logic we engage in when we do standard null hypothesis significance testing. The problem is that this is an incorrect translation of the problem to logic. In this case, it is not okay to go from the probability ℙ(reject null | null is false) to ℙ(null is false → reject null). The latter is the same as ℙ( ¬ null is false OR reject null), i.e. ℙ(null is true OR reject null). The former is the proportion of tests that detect true effects, whereas the latter is the proportion of tests that detect effects plus the proportion of tests where there genuinely was no effect. Moreover, since we calculate the power directly based on the significance α we wish to achieve, power is a function of p-value; that is to say, they have a 1:1 relationship. Moreover, they have an inverse relationship: the lower the p-value, the higher the power. Why? Because all else being equal, a test with a higher power should be able to detect an effect with a higher significance level, and therefore a lower p-value. Bearing this in mind, it is contradictory to use high power as evidence for the null, since a high power corresponds to a low p-value, and we (correctly) use a low p-value as evidence against the null. If you run two tests and one of them has a higher power than the other, it does not provide more evidence for the null because it must also simultaneously have a lower p-value, which is evidence against the null. This fact is explained in much greater detail by Hoenig and Heisey in “The Abuse of Power” (pdf). Bottom line: a high statistical power is not evidence of the null. Important thing #3. If you find yourself wanting to “prove” the null hypothesis when you are testing whether one variable affects another in a meaningful way, the proper way to do it is through equivalence testing. It is often the case that the very thing you want to prove is the absence of an effect. In this situation, you cannot use any test that assumes the absence of an effect as its null hypothesis. As the core of null hypothesis significance testing is proof by contradiction, you need to use a test that assumes the presence of an effect, and then show that the observed data is very unlikely under that assumption. I will not attempt to describe these techniques in detail in this post, except to say that they are generally referred to as “equivalence testing” (a one-sided version of this, which assumes the presence of an effect in a particular direction, is often referred to as a “noninferiority test”). A very common way of doing this is through what is known as a “two one-sided test” or TOST test, explained very thoroughly by David Streiner in “Unicorns Do Exist” (pdf). It basically boils down to picking an “equivalence interval” such that our null hypothesis is “the difference between means is greater than this equivalence interval”. The alternative hypothesis then becomes “the difference between means is smaller than the equivalence interval”, i.e. the difference between means is sufficiently small that we consider them equivalent. Bottom line: to show the absence of an effect, use a test where the null hypothesis is the presence of the effect. In an earlier post I discussed how to use inverse transform sampling to generate a sequence of random numbers following an arbitrary, known probability distribution. In a nutshell, it involves drawing a number x from the uniform distribution between 0 and 1, and returning CDF-1(x), where CDF is the cumulative distribution function corresponding to the probability density/mass function (PDF) we desire. The PDF in question is a massive joint PDF over many variables, and so solving the integral is intractable. In particular, the second case is very common in machine learning applications. However, what can we do if we still wish to sample a random sequence distributed according to the given PDF, despite being unable to calculate the CDF? Choose an arbitrary starting point x in the space. Remember P(x) as given by the PDF. Jump away from x by a random amount in a random direction, to arrive at point x’. If P(x’) is greater than P(x), add x’ to the output sequence. Otherwise, if it is less, decide to add it to the output sequence with probability P(x’)/P(x). If you have decided to add x’ to the output sequence, move to the new point and repeat the process from step 2 onwards (i.e. jump away from x’ to some x”, and if you add x”, then jump away from it to x”’ etc). If you did not add x’ to the sequence, then return to x and try to generate another x’ by jumping away again by a random amount in a random direction. The PDF of the sequence of random numbers emitted by this process ultimately converges to the desired PDF. The process of “jumping away” from x is achieved by adding some random noise to it, this is usually chosen to be a random number from a normal distribution centred at x. Why does this work? Imagine that you’re standing somewhere in a hilly region, and you want to visit each point in the region with a frequency proportional to its elevation; that is, you want to visit the hills more than the valleys, the highest hills most of all, and the lowest valleys least of all. From your starting point, you make a random step in a random direction and come to a new point. If the new point is higher than the old point, you stay at the new point. If the new point is lower than the old point, you flip a biased coin and depending on the result, either choose to stay at the new point or return to the old point (it turns out that in practice, this means choosing the lower point with probability P(x’)/P(x), but I will not bother proving why here). If you do this for an infinitely long time, you’ll probably visit most of the region at least once, but you’ll have visited the highest regions much more than the lower regions, simply because you always accept upwards steps, whereas you only accept downwards steps a certain amount of the time. A nifty trick is to not use the desired PDF to calculate P(x) directly, but instead to use a function f such that f(x) is proportional to P(x) (this results in the same probability for deciding whether to accept a new point or not). Such proportional approximations are often easier to compute and can speed up the operation of the algorithm dramatically. You may have heard of the Metropolis algorithm being referred to as a Markov chain Monte-Carlo algorithm. There are two parts to this; the first is “Markov chain” — this is simply referring to the fact that at each step of the algorithm we only consider the point we visited immediately previously; we do not remember more than just the last step we took in order to compute the next step. The second is “Monte Carlo” — this simply means that we are using randomness in the algorithm, and that the output may not be exactly correct. By saying “not exactly correct”, we are acknowledging the fact that the distribution of the sequence converges to the desired distribution as we draw more and more samples; a very small sequence may not look like it follows the desired probability distribution at all. The Kolmogorov–Smirnov test (K–S test) tests if two probability distributions are equal. Therefore, you can compare an empirically observed distribution with a known reference distribution, or you can compare two observed distributions, to test whether they match. You can think about it this way: if you plotted of CDFA and CDFB together on the same set of axes, D is the length of the largest vertical line you could draw between the two plots. This image illustrates the CDFs of two empirically observed distributions. The K-S test statistic is the maximum vertical distance between these two CDFs, and is represented by the black line. To perform the Kolmogorov-Smirnov test, one simply compares D to a table of thresholds for statistical significance. The thresholds are calculated under the null hypothesis that the distributions are equal. If D is too big, the null hypothesis is rejected. The threshold for significance depends on the size of your sample (as your sample gets smaller, your D needs to get larger to show that the two distributions are different) and, of course, on the desired significance level. The test is non-parametric or distribution-free, which means it makes no assumptions about the underlying distributions of the data. It is useful for one-dimensional distributions, but does not generalise easily to multivariate distributions. In this post I’d like to briefly describe one of my favourite algorithmic techniques: inverse transform sampling. Despite its scary-sounding name, it is actually quite a simple and very useful procedure for generating random numbers from an arbitrary, known probability distribution — given random numbers drawn from a uniform distribution. For example, if you had empirically observed from a database that a variable took on some probability distribution, and you wanted to simulate similar conditions, you would need to draw a random variable with that same distribution. How would you go about doing this? 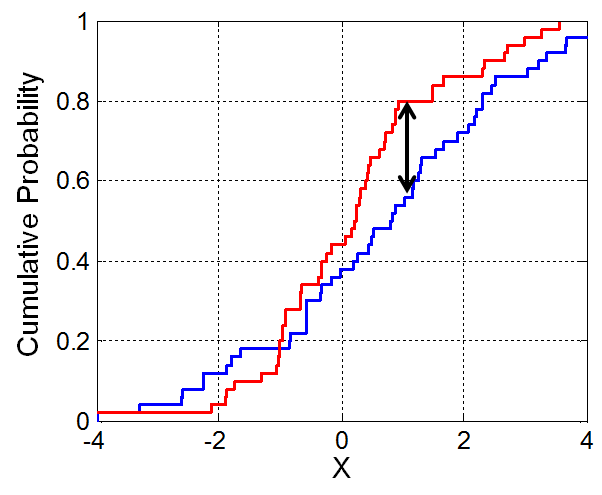 Generate a random value x from the uniform distribution between 0 and 1. Return the value y such that x = CDF(y), where CDF is the cumulative distribution function of the probability distribution you wish to achieve. Why does this work? Step 1 picks a uniformly random value between 0 and 1, so you can interpret this as a probability. Step 2 inverts the desired cumulative distribution function; you are calculating y = CDF-1(x), and therefore the returned value y is such that a random variable drawn from that distribution is less than or equal to y with probability x. Thinking in terms of the original probability density function, we are uniformly randomly choosing a proportion of the area under the curve of the PDF and returning the number in the domain such that exactly this proportion of the area occurs to the left of that number. So numbers in the regions of the PDF with greater areas are more likely to occur. The uniform distribution is thereby projected onto this desired PDF.